Hungaroton was founded in 1951, when its only competitors in the Hungarian music market were record labels like Melodiya, Supraphon and Eterna (de ) from other socialist countries. Previously called Qualiton, its name was changed to Hungaroton in the mid-1960s, though the Qualiton brand remained as a label for operetta and gipsy music releases. Also new popular music, rock and jazz labels (Pepita, Bravó, and Krém) were founded. Supraphon Music Publishing is a Czech record label, oriented mainly towards publishing classical music and popular music, with an emphasis on Czech and Slovak composers. Qualiton is a frequently used record-label name in different countries. There have been and there still are several labels known as Qualiton, in particular the Hungarian state-owned corporation during the post-World War II years in Europe. The company changed its name to Hungaroton in the mid-1960s, but the Qualiton label remained for gypsy music and operetta repertoire. Other records labels bought the Qualiton license from Hungaroton and eventually became their own labels. Discos Qualiton and Qualiton South Wales are examples of the latter. The Brill Building is an office building located at 1619 Broadway on 49th Street in the New York City borough of Manhattan, just north of Times Square and further uptown from the historic musical Tin Pan Alley neighborhood. It is famous for housing music industry offices and studios where some of the most popular American songs were written. It is considered to have been the center of the American music industry that dominated the pop charts in the early 1960s. Vilmos Szabadi, is a Hungarian violinist. He is the double prize winner of the prestigious MIDEM Festival in Cannes, FRANCE. “PRIMA”, HUNGAROTON, Liszt prized artist. In 2018 the Bartók-Pásztory prize was awarded him. Head of Violin Department of the Liszt Ferenc Academy of music, Budapest. So far 59 CDs were released by his contribution, mainly by HUNGAROTON record company. He is invited whole over the world giving master classes as Tokyo, Helsinki, Isa Austria, Singapore and USA etc. In the previous years he is steady Jury members of leading international violin competitions. Szabadi studied under Professor Ferenc Halász at the Franz Liszt Academy of Music in Budapest where on receiving his diploma, he became the youngest-ever member to join the teaching staff. Then he studied, after graduation, with Sándor Végh, Ruggiero Ricci and Loránt Fenyves. In 1982 he won first prize in the Hungarian Radio Violin Competition and the following year in the Jenő Hubay competition in Budapest. In 1985 Szabadi was awarded 3rd prize at the international Jean Sibelius Violin Competition in Finland where he has since been invited to perform regularly and to give master classes. Anima Sound System is a Hungarian electronic band founded in 1993 in Szombathely. Anima is one of the first and most important Hungarian electronic acts, a unique fusion of Eastern-European folk music and modern electronic styles. The band is currently signed to the Mole Listening Pearls record label. The band soon developed strong ties with the underground Tilos Rádió station in Budapest. Their first international performance, in 1996, took place in Vienna at "Soundsfair Festival", along with bands like Red Snapper, Goldie and Nightmares on Wax. József Gregor was a renowned Hungarian bass-baritone/basso buffo who enjoyed success first in Hungary, then in France, Belgium and Canada, and finally in the United States. József Gregor was born in Rákosliget, a small town that is now part of Budapest. He studied violin for ten years and then, voice at the Liszt Academy in Budapest for one year but did not graduate. He started singing with the Hungarian Army chorus in 1958 before becoming a soloist in National Theatre of Szeged in Hungary. In Europe he sang in many opera houses, including Vlaamse Opera and La Scala in Milan. Beginning in 1989, József Gregor appeared in the US with the Portland Opera and later with the Houston Grand Opera and the Metropolitan Opera. His most famous roles included Sarastro, Osmin, Falstaff, Don Pasquale, Dulcamara, Don Basilio, Don Bartolo, Don Magnifico, Boris Godunov, Varlaam, Philip II, Bluebeard etc., roles in masses and oratorios, musicals, and songs. He died in Szeged of gastric cancer. Compared to other Hungarian music albums of the time, the sound of Locomotiv GT was heavier, and with the exception of "Ezüst nyár", the album lacked so-called hits. That was the result of a conscious decision made by the group; they intended to play high-quality rock music resembling more to that of made by English and American groups. Unlike albums released by LGT in the second half of the 1970s, the instrumentation of Locomotiv GT is somewhat simple, the saxophone being the only "exotic" instrument. The music is built around the virtuoso guitar playing of Barta and the masterful organ playing of Presser; in addition, Frenreisz plays his bass more powerfully than most of his Hungarian peers, and the drumming of Laux is also worth to mention. The style of the songs does not really fit in with the typical Hungarian pop music of the time; that is, it is more mature, although it cannot be called progressive rock in its traditional sense. Improvisation, showing the skills of the musicians, was employed more frequently in songs, such as "A Napba öltözött lány", "A tengelykezű félember", and "Hej, én szólok hozzád". The influence of American blues-rock and jazz are also evident. The lyrics were written by Anna Adamis, who provided the lyrics to most Omega songs between 1968 and 1970. Hunyadi László is an opera in three acts by the Hungarian composer Ferenc Erkel. The libretto, by Béni Egressy, is based on a play by Lőrinc Tóth. The opera was first performed at the Pesti Nemzeti Magyar Szinház, Budapest on 27 January 1844. Hunyadi László is considered to be the first important Hungarian opera and Erkel's musical style draws on folk influences, particularly the dance known as the verbunkos. György Szabados was a Hungarian jazz pianist, and is sometimes referred to as the "father" or "unofficial king" of the Hungarian free jazz movement since the 1960s. 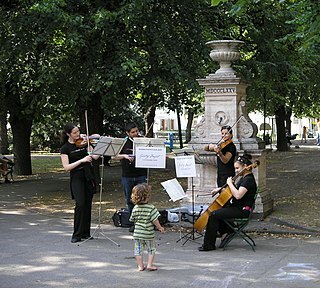 The Tátrai Quartet was a Hungarian classical string quartet founded in 1946 and based in Hungary. For the half-century after World War II it was one of the foremost string quartets in Hungary, specializing in Haydn and Bartók, whose complete quartets it recorded for Hungaroton, Mozart and Beethoven as well, and were also responsible for first performances of works by certain Hungarian composers. CGD was an Italian record label. Pál Lukács was a Hungarian viola virtuoso, concert and recording artist, and music educator. Miklós Kocsár is a Hungarian composer. Székelyfonó is a one-act theatre piece with music by Zoltán Kodály from Hungarian folk songs. The work is described as ‘Daljáték egy felvonásban’, folk songs in one act. First created in 1924 as a short cabaret with a small accompanying orchestral ensemble, Kodály expanded the work, with mime but without dialogue for a full production at the Royal Hungarian Opera House, Budapest in 1932. The songs and dances are taken from Transylvanian folk music, and include spinning choruses and musical pictures representing death, burial, betrothal and marriage folk-rituals. The work is sometimes referred to as The Transylvanian Spinning Room in English. Klaus Heymann is a German entrepreneur and the founder and head of the Naxos record label. Tibor Ney was a Hungarian violinist and music teacher.